Posted by Dissent at 8:38 pm	Hack, Health Data, U.S.
Having to notify almost 2,800 patients because an employee fell for a phishing attack is not something most healthcare providers would exactly relish. Having to notify 2,800 patients in July and then another 744 patients in August because there were phishing incidents in two consecutive months, well,….. ouch. But that’s the situation Kaleida Health in New York found themselves in this summer, as notifications on their web site reveal. Hopefully their remedial steps and training will reduce the likelihood of more phishing incidents. 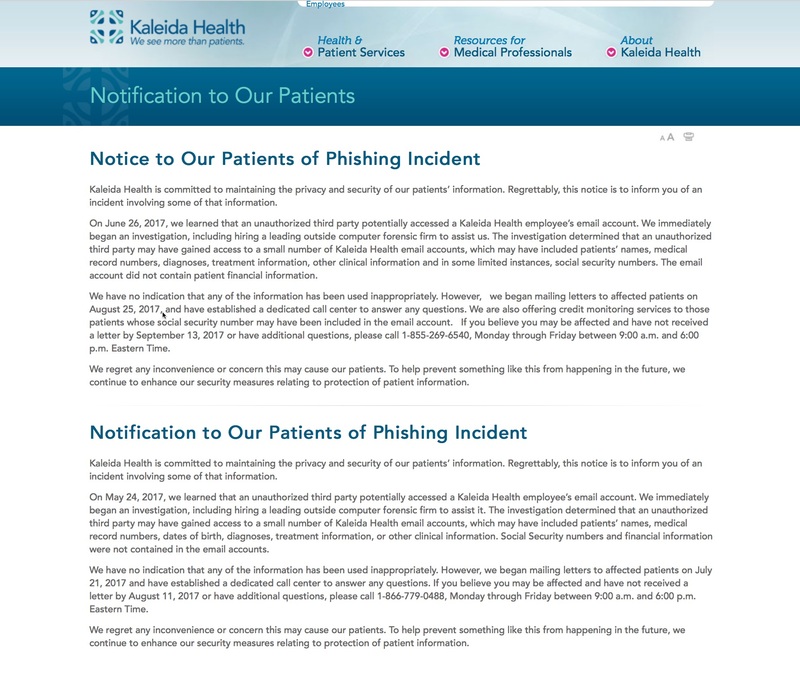 Kaleida Healh discovered phishing incidents in May and then again in June of 2017. More than 3,000 patients had to be notified.